The veg-centric movement continues to grow exponentially as chefs seek new ways to create craveability around produce-focused menu items. The R&D is not focused on vegetarianism, but rather, produce-driven dishes that put flavor first, often relying on meat to help deliver on that promise. As the veg-centric movement grows, so do consumer expectations, and flavor accents become increasingly important in delivering that “wow” factor. Although new to mainstream America, produce-centric dishes with signature flavor are a big part of many global food traditions, from the clean flavors of a Mediterranean artichoke carpaccio to the lively profile of a Southeast Asian take on steamed greens with whipped red miso and honey. As this trend continues to grow, it makes sense to take a culinary look outside of our borders, exploring the veg-centric traditions and tweaking them for modern American menus. 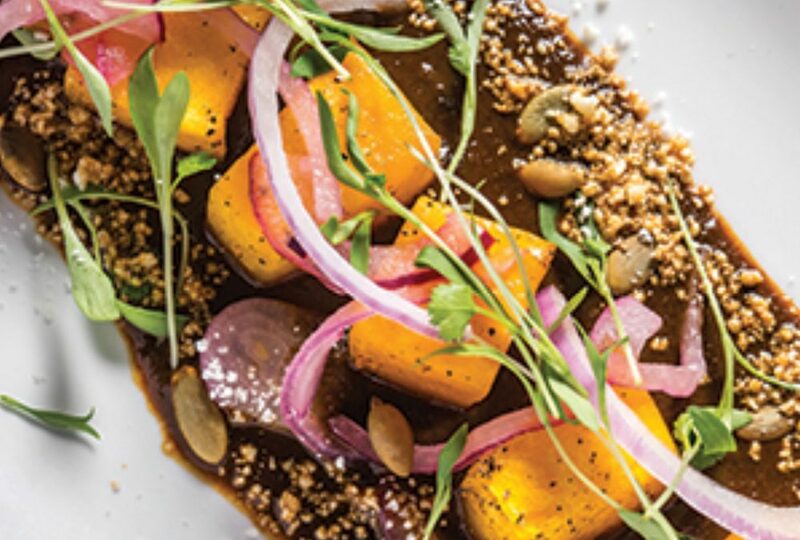 Produce takes on hearty Mexican flavors in the Mole con Calabaza at Maya in New York. Roasted pumpkin is accompanied by a rich mole sauce, pumpkin seeds and Cotija cheese. We’ve seen the proliferation of ethnic ingredients, with street foods and global mash-ups demonstrating the flavor potential of reaching into far-flung pantries. Driving this innovation is the younger consumer, now made up of both Millennials and Generation Z. They are defined by culinary curiosity and a commitment to feel-good food. They are interested in sustainability, the condition of our planet, and in health and well-being. Couple this with the tremendous press reporting of the positive health implications of eating more produce, and it’s no wonder this movement is huge. Add in the global element, and you’ve got potential for signature, craveable produce-centric dishes. Notable concepts that have embraced a larger plant-based menu inflected with global flavors include SweetGreen, a healthy fast-food concept with 27 locations serving organic and local ingredients. Recent offerings include the Spicy Sabzi Salad with organic baby spinach, kale, beets, spicy broccoli, spicy quinoa, carrots, bean sprouts, basil, roasted organic tofu, Sriracha and carrot-chile vinaigrette. Danny Meyer’s Union Square Hospitality Group recently made a minority investment in Tender Greens, a chain based in California. Menu items include the Mediterranean-inspired Salami & Kale, with roasted fennel, golden raisins, fingerling potatoes, crispy garbanzo beans and Parmesan in a roasted garlic vinaigrette. Other chains such as Lyfe Kitchen, True Food Kitchen and Lemonade are also leading the way in vegetable innovation, showing that produce can be craveable and profitable. 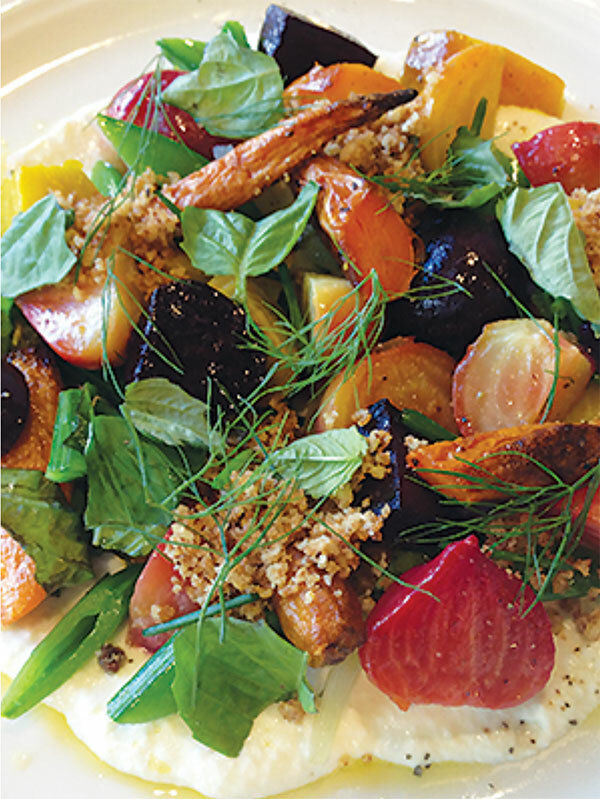 Examples include Lemonade’s Tandoori Carrots, with orange lentils, chia seeds, almonds and a tahini vinaigrette. And there’s True Food’s Panang Curry, with brown rice, quinoa, potato, broccoli, ginger, carrot, mushroom and coconut-shellfish broth. Vegetables are clearly at the forefront of menu strategy. Taking a cue from places around the world, where vegetables are embraced and celebrated, we’ve highlighted four regions with unique flavoring characteristics when it comes to produce. These techniques are ripe for American menu innovation. They demonstrate freshness and flavor and adventure—a winning combination in today’s market. Roasted beets with basil, white bean and Meyer lemon hummus showcase a veg-centric medley with Mediterranean influence. Jamaica boasts an entire plant-based cuisine called “i-tal,” which was developed over many years by the Rastafarian culture. Vegetables are prepared without any salt, sugar, honey or other ingredients, allowing the true flavors to emerge. For example, greens like spinach, collards, mustard greens and typically callaloo, a spinach-like plant, are steamed along with green onion, fresh thyme and hot peppers, which impart herbaceous and spicy notes to the wilted leaves. Root vegetables are often simmered over wood fire, flavored by rich mushroom-based vegetable stock. Another popular way to serve vegetables is to make them “escoveitch/escovitch,” or pickled, also known as escabeche. This island foundational flavoring method was a staple well before the trend in pickling surfaced. A spicy aromatic vinegar with allspice berries, ginger, hot peppers and thyme is used for root vegetables, chayote squash and onions. The spiked vegetables are eaten alone or simmered with fish filets, conch or shrimp. The natural flavors of produce are enhanced in several unusual ways throughout Southeast Asia. Combining vegetables and sweet fruits with hot peppers, soy sauce, fish sauce and pungent herbs creates an explosion of umami, along with an unexpected but pleasing flavor combination. Fresh pungent herbs such as culantro (a cousin of cilantro), Thai basil, mint and herbs are tossed into hot dishes at the last moment to perfume broths and warm salads. Another flavor builder in veg-centric dishes is the fried chip, made with lemongrass, garlic and shallots. These crunchy shards of intense flavor are featured in salads, broth-based dishes and sandwiches. Acidic ingredients such as fresh lime, tamarind and aged red or black palm vinegar brighten dishes beautifully. Of course, fish sauce runs through the cuisine and boosts umami in many vegetable-based dishes. Texture is exploited, resulting in craveable vegetable cookery. Crispy, rice-batter pancakes are loaded with delicate fresh herbs, lettuces, pulled chicken, pork and juicy bean sprouts, then drizzled with intense fish sauce and fiery sambal. Steamed delicate vegetables like greens, bok choy, leeks, cabbage and chayote get a flavor boost from a drizzle of whipped red or white miso, sesame oil, agave or honey, and yuzu or other citrus juice. Vegetables are elevated in the simplest, cleanest ways in countries like Italy and Greece. The use of extra- virgin olive oil, citrus, unusual salt flake varietals and pungent cheese are perfect partners with produce. A dish of artichoke carpaccio doused with really good olive oil, lemon and Parmigiano-Reggiano is inspiring.There are more than 20 countries bordering the Mediterranean, and each has its own traditional condiments and dry spice rubs. These add immense flavor to vegetables. Muhammad, a popular dip originating in Syria, is made with roasted red pepper, walnuts, garlic, lemon and cumin, and stands up well to any grilled vegetable, especially eggplant steaks. Ras el hanout, a spice-market blend from North Africa, can be tossed with any root vegetables and drizzled with olive oil before roasting, making a flavor enhancer capable of filling an entire room with warming aromas of cinnamon, cardamom and ginger. Za’atar, another beloved spice blend with thyme, sesame, sumac berries and oregano that has flourished for centuries in this region, takes a leading role in making vegetables shine. Tzatziki, with its creamy yogurt-based mouthfeel and tart flavor, makes any delicate vegetable a welcome plate partner. 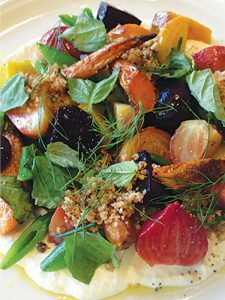 Latin-inspired flavors pair well with vegetables, because they have an acetic, slightly sweet-and-spicy profile, which can accompany steamed and water-cooked vegetables, grilled vegetables with a smoky, bold flavor or oven-roasted vegetables. Chimichurri complements produce, too, with its vinegary, garlicky and peppery profile. Consider a sofrito made with peppers, onions, tomatoes, garlic and lime juice. When it comes to amped-up vegetable-centric recipe development, Peru’s pantry is ripe for a raid. Salsa Huancaína, a Peruvian spicy cheese sauce made with the yellow pepper aji amarillo, provides dramatic golden color and vibrant flavor to delicate vegetables without overpowering them. Meanwhile, creamy salsa de rococo is a mayonnaise-based red hot pepper sauce made with rocoto peppers, ideal for earthy mushrooms, kohlrabi steaks or grilled romaine. Adding veg-centric dishes to menus can easily introduce a global adventure or a rewarding culinary movement—and is definitely taking on a life of its own as a new menu category.